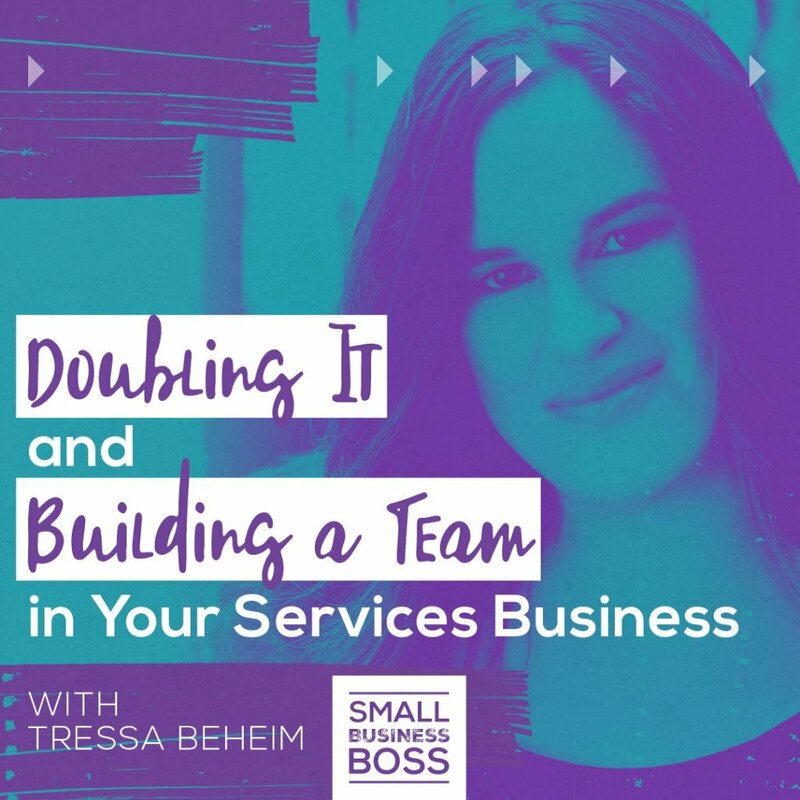 Today’s guest is Tressa Beheim, and I’m so excited to share today’s interview with you, as she’s a long-term member of the Double It Mastermind. When I met Tressa a little over two years ago, she was just starting her business, and her growth since then has been incredible. What I love about Tressa is her commitment to consistently growing her business and doing the internal work to ensure that it’s done in a healthy way. Plus, she’s pretty no BS — which you all know is how I am! Tressa Beheim is an online business manager, which is part project manager, back-office coordinator, and a people wrangler who knows online marketing inside and out. She’s helped create products that have brought in over $500,000 and supported countless launches. Tressa has years of online business experience along with a corporate background in management, finance and holds an MBA. Tell us about your business and how you make money? I’m an online business manager, and I work primarily with female entrepreneurs — coaches, consultants, a whole variety of women — but the one thing they have in common is that they have some sort of online business, and they want to change the world in their own way. If I came to you as a woman who wanted to change the world, what could you do for me? Most of the support I provide is around marketing, the backend of your business, and all the things that need to happen to get your offers out there, to get your content out there. My team and I provide the day-to-day support that needs to happen for everything you want to accomplish. How did you fall into this role of online business management? I started as a VA about eight or nine years ago. I worked for a variety of people as a freelancer. Then I started working for one particular business full-time, and I did that for several years. When I moved to Germany, it became apparent that I needed to find some other source of revenue. So I decided to start my own business and offer my services on my own. My initial goal was to replace my salary, and I was able to do that within the first couple of weeks. It was so exciting because it was the first inkling that maybe this was really going to work. It feels like a fluke at first, but then month after month, you realize that you’re really doing it. You’ve been in business for two years and have doubled your business twice. Can you talk about what that looks like and how you’ve been able to accomplish that? I was starting with a huge network of potential clients who knew me from my past career, so I was able to immediately get clients and referrals. I invested in my business as a business from day one. I realized I needed business mentorship, a bookkeeper, and knew that I couldn’t do this by myself. Very quickly, I found you and the tools I needed to really do this as a business — not just as a hobby or something that I was just playing with. I treated it very seriously as a business, and the mindset around that made me realize that I had to do what it took to make it successful. There were a lot of scary things that I had to do right away and that I had to do over the last two years— things that I would never have done voluntarily — but I realized if I wanted my business to grow, I had to do the scary things. I had to become more visible, I had to put myself out there in a bigger way. While I still have a lot of work to do around that, I’ve done a lot of things that two years ago, I would have looked at you and said you were insane if you expect me to do that. I continue to do that all the time. You’ve never wavered about providing only services as opposed to courses and such. For me, I knew that’s not what I wanted. I wanted a service-based business, and that’s how I’m going to build what I have now and what is going to support whatever I have in the future. It’s very important to me that whatever I do, it always comes back to how do I build my service-based business. What have been some of your biggest lessons along the way? One of the lessons I’m learning right now is that everything takes longer than you think it’s going to. At the beginning of 2018, I had a goal of completely removing myself from client execution, and I thought I could do that within 60 days. I’ve had to accept that that’s okay, that my initial goal was a little delusional. It’s going to take longer, but I will eventually get there if I keep doing the work and taking the steps that need to be taken. You have to be willing to do things that you don’t immediately think are what you should be doing. In my case, it was writing blog posts and newsletters. Your first instinct might be, “That’s a terrible idea,” but think it through. Why is it a terrible idea? Are you scared of it or is there a legitimate reason why you shouldn’t be doing it? How has hiring a team helped you continue to grow, and how do you structure your team? I realized about six months in that I was capped out at what I was personally capable of providing for my clients. I realized there was a lot more demand out there, and there was a lot more that I had the ability to give my clients, but I could only do that if I had a team. I started very slowly and very intentionally. I added one core person who ended up being the most amazing hire I could have ever found, and I’ve made her my right hand. She’s become an integral part of my business to date. Then I slowly started looking at what’s the next role that we need to hire, what’s the next thing that is holding us back from providing better services for our clients? That’s how I added person by person. It hasn’t been perfect; there have been times where we’ve been overwhelmed because we’ve probably needed another person. By being very strategic and by really thinking through the role this person needs to fill. It’s allowed me to make sure I find the right people to fill the right roles. One of my most important things is that I don’t want people doing things that they hate. Is there a way I can redistribute the work? Let’s give people roles that actually make sense because it’s going to serve them, and ultimately, it’s going to serve me and my business much better if my team is happy. Very often, I don’t hire for skill, I hire for attitude and reliability. I teach them what they need to know. A lot of my clients are referrals. People also find me on Google. I’ve spent a lot of time focusing on SEO (with your team’s help, of course!) and content writing so people can find me on the Internet. You’ve been a part of the Double It Mastermind for the last two years. How has this experience contributed to your growth? It was one of the smartest decisions I’ve ever made. At first, I thought I’d do this for three months and then move onto something else. I quickly realized that these are my people, this is my group, these people get me, and you provide the mentorship that I really need, and that’s really hard to find. So much of the online world is focused on build a course, build a product, that’s the answer to all your problems. Finding someone who just focuses on services and building a sustainable service-based business that you can scale, and suits your life is so important. I need that gut check so that when I start falling into the noise, there’s always this core group of people to help me come back to my ultimate reason for doing this. Even though you live in Germany, you have come to every Double It retreat. How has the in-person experience and forming relationships within the group helped your business? A few members of the mastermind actually became my clients. I have several that I’ve worked with as collaborators. I have some that help me provide services to my clients. I’ve also found several that have helped me with other services. Beyond that, it’s the support and making those relationships with people in person and getting to connect in that little bubble that we create at the retreats. It’s really amazing, and it helps carry you through the rest of the time when you feel isolated. That person to person interaction just really helps ground me and makes me feel like I’m really doing this. When you have that separate time away from the day-to-day hustle, it’s so much easier to figure out those things that have been bothering you and those things you really need to focus on. It’s so easy to think that there is no solution for this; I just have to deal with this forever. But at the retreats, you get the collective genius of the group helping you solve your problem or figure out what to do with that opportunity. Who should join Double It and why should they join us for 2019? If you are looking to increase your business or even make your current business make more sense in a sustainable way so that you can do the things you want to do both in business and in your life, I think Double It can help you do that. You have to be open to growing your service-based business, and the core message that Maggie shares with us is you can do it a sustainable, smart way. It’s okay if you don’t want to grow a seven-figure business overnight. You can still grow your business even if that’s not your goal. Tressa shared how she’s doing things now that she never ever would have thought she’d do in her business two years ago. This is an amazing lesson as it goes to show that we shouldn’t get too attached to what we think things will be like or how things will evolve. We need to make room to be open to what we may need. She shared one of my fave lessons: Everything takes longer than you think it will. This point from Tressa is something we all need to remember — no matter how fast or easy or simple everyone wants us to think it should be online. Tressa shared her experience of building a team and how she’s hired for fit more than for skillset. Many times, I see business owners hire only for skills and then wonder why they don’t like working with their team or they struggle to connect with them. Having that personality fit is key as it will help you build a team that can go the distance.